This article is about the character. For the mission by the same name, see The Mighty Octostomp!. For the mission in Splatoon 2, see The Octostomp Returns. — The Octostomp at the beginning of The Octostomp Returns mission. The Octostomp is a one of the Great Octoweapons encountered in Octo Valley and later reappears in Octo Canyon and the Octo Expansion. The Octostomp was an Octoweapon created during the Great Turf War by the Octarians. When it seemed that victory had smiled upon the Octarian army, a plug was pulled and caused the Octostomp and the rest of the Octarian mechs to shut down. Nearly 100 years later, the Octostomp was brought back to life by the power of a Zapfish in order to attack once again. 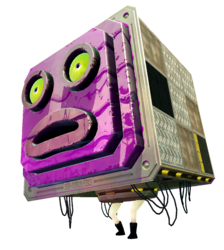 The Octostomp is a robotic Octarian in the shape of a large cube with several layers on its Octotrooper-like face covered in purple ink. It has nine metal panels on most of the sides other than the front and bottom and has a hole on its back where a tentacle can grab Zapfish. It also has two Octarian feet that somehow are strong enough to make it jump. In the second game, the Octostomp is given an ink-proof jacket, that appears to be made of thermal fabric, along with a rubber belt. Agent 3 facing off against the Octostomp. In Splatoon, the Octostomp is the first boss Agent 3 encounters. It appears in the mission The Mighty Octostomp!, where they have to dodge its attacks and climb up its body to splat the tentacle. Each time, it will remove several panels from its body, making it harder to climb. Once Agent 3 has splatted the tentacle a third time, the Octostomp will be defeated and explodes. Neo Octostomp with its new "coat". In Splatoon 2, the Octostomp comes back in the fittingly named mission, The Octostomp Returns, where this time it comes with a few tricks up its sleeve. The first phase plays out normally, where Agent 4 must dodge then climb its back to splat the tentacle. In the next phase, however, it gains an uninkable coat with a belt around it and is called the "Neo Octostomp". Now, Agent 4 must shoot the buckle to remove the coat while avoiding a Splatling and continue from there. In phase 3, it once again obtains the coat, but now has two extra faces, making its attacks more difficult to avoid. After the third tentacle has been splatted it explodes, just like last time. The Octostomp appears for a third time in the Octo Expansion, where it has been Sanitized and renamed "Octostomp Redux". It now resides in Drop the Bass Station where it can be battled. The boss battle is very similar to the one in Octo Canyon, with its ink-proof coat, but it is now able to use the Bubble Blower. After Agent 8 has splatted the tentacle enough times, Octostomp Redux will be defeated and will, like always, explode. So far, the Octostomp is the only boss to be battled in all of the single-player campaigns. The Octostomp is the only Octarian boss to have any dialogue. Octostamps, Octostamp DXs, and Octoseekers all appear to be based on the Octostomp. It is so far unknown how the Kamabo Corporation managed to copy and sanitize the Octostomp, along with the rest of the bosses. It is also implied that the Octostomp remembers its last battle when it says "Back like I never left", despite being Sanitized. Concept art of the Octostomp. Agent 3 battling several Octarians alongside the Octostomp. Artwork of the Mighty Octostomp in the credits. Agent 3 playing tic tac toe on the Octostomp. Artwork of the Neo Octostomp can be seen in the credits. The Octostomp before being activated by a Zapfish. The Octostomp in phase two, with fewer tiles on its sides. The Octostomp in phase three, with even more tiles removed. The Octostomp stunned after attacking. Ink left behind by the Octostomp. Neo Octostomp using a Splatling. Neo Octostomp with two extra faces. A Sunken Scroll showing the creation of the Octostomp. Phase two of the Octostomp Redux. The Octostomp Redux in phase three. I'm BAAAAAAAAACK! And I brought this sweet new coat! Back like I never left! Dutch Ik ben er weer! I'm back! Dutch Verser dan ooit! Fresher than ever! Dutch Terug van nooit weggeweest! Back from never being away!